Cloud-based, enterprise-grade protection for small business devices and email. Trend Micro™ Worry-Free™ Services Advanced is cloud-based security designed specifically for small businesses with award-winning device and email protection. To save you time and resources, it is hosted and maintained by Trend Micro and combinesWorry-Free Services to protect your devices and Hosted Email Security to protect your email. Our solution includes anti-malware, antispam, web security, data protection, and advanced targeted attack protection. Features mobile device management for Android and iOS, including remote lock, remote wipe, and password management. 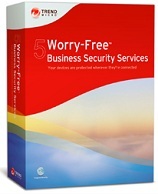 For full system requirements, visit www.worryfree.com.